They don’t get flashy TV graphics and palpitation-inducing sound effects the way election returns do, but daily news cycles are an important battleground fought over by political campaigns — and never so fiercely as in the last 48 hours before voters go to the polls. That’s why Hawaii Congresswoman Tulsi Gabbard’s endorsement, coming two days before Super Tuesday, was so incredibly clutch. A telegenic female combat veteran quits a plum position in the Democratic National Committee to throw her support behind a candidate who is trailing in delegates and in the Super Tuesday polls, citing his national security judgment as her rationale. That kind of profile in courage was destined to dominate the news, and it did. 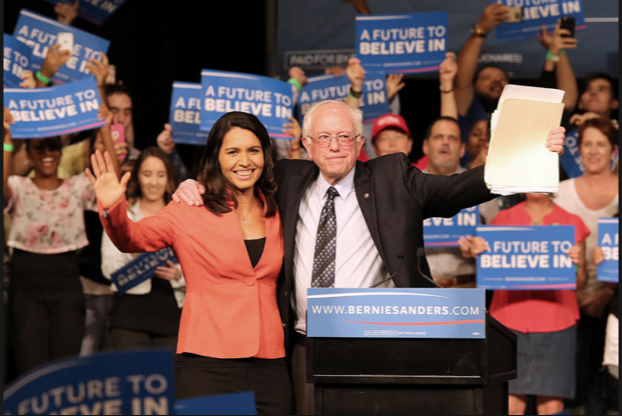 Gabbard drew an avalanche of positive press for Sanders, blanketing the weekend political talk shows and inspiring scores of glowing profiles. In particular, her praise of his national security judgment, and the contrasts she drew with Clinton’s penchant for intervention and regime change helped shore up one area of Sanders’ qualifications that, at least according to the prevailing corporate media narrative, needed strengthening. Her resignation as vice chair of the DNC provoked a rehash of her earlier dissent from the party leadership’s unpopular decision to both limit and bury the Democratic debates, an apostasy Chairman Debbie Wasserman Schultz punished her for by disinviting her from the first debate. Those stories reminded voters that Sanders is fighting not just Clinton, but the entire DNC establishment. Of course, Sanders’ dramatic poll-defying 1.5 point win in Michigan was the result of many things — a record turnout from his “unlikely voter” army, anger and frustration with trade deals that the campaign successfully hung around Clinton’s neck, the fire hose of small dollar donations that helped him win the ad war $1.2 million to $979K, and tens of thousands of volunteer and paid staff hours. But with such a squeaker of a win, it’s easy to make the argument that Gabbard’s dominance of the final two news cycles put him over the top, and that she should share in the credit for both the “W” and for his palpable post-Michigan momentum. Now a regular surrogate traveling with the campaign, Gabbard has inspired VP talk. It would certainly be a groundbreaking ticket: the first Jew and the first Hindu; the oldest presidential candidate and the youngest vice presidential candidate. 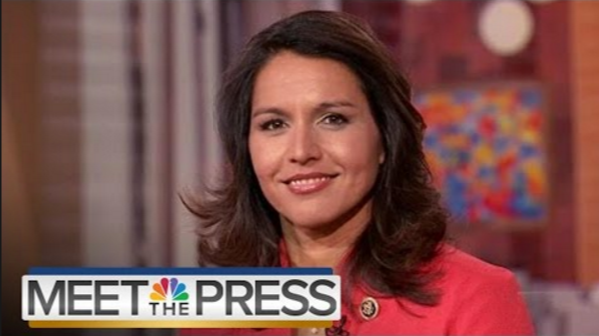 Gabbard would also have a shot at becoming the first female vice president. Of course the ticket talk is premature, and Gabbard may well have to face a more grim reality: the fearsome long knives of a President Hillary Clinton, who reputedly never forgets a slight. But no matter whether she ends up as Sanders’ running mate, in his cabinet or remains in Congress, her eleventh-hour boost in an arguably must-win state should never be forgotten. Carrie Miller is an award-winning Chicago-based freelance journalist, a formidable home chef, and will win drinks off of you playing pool.